Assertive Communication Build The Independent You | Free eBooks Download - EBOOKEE! Posted on 2019-04-12, updated at 2019-04-14, by fubber. Identify the main five communication styles in yourself and others. Identify and manage ten main cognitive distortions. Express your emotions in an assertive manner. Say "No" to unreasonable requests assertively. Use assertiveness techniques in personal and professional communication contexts. Identify and activate assertive nonverbal cues. 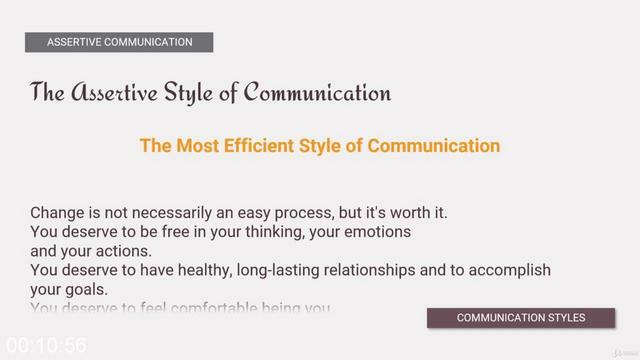 Learn the most effective style of communication and become more independent in your thinking, your emotions and your social interactions. Start building the Independent You right now through Assertive Communication. Regain the confidence in your inner power to create the future you want. Assertive Communication is one of the top skills that people want to learn how to master, due to its extensive applications in both personal and professional contexts. Assertiveness is the key toward an authentic and independent life. Thoughts, emotions and behaviors that rely on the assertive principles allow you to break free from toxic contexts and focus on your own significant goals. Learn how to activate The Assertive Style of Communication and you will be able to approach personal and professional contexts in a confident, goal-oriented manner. 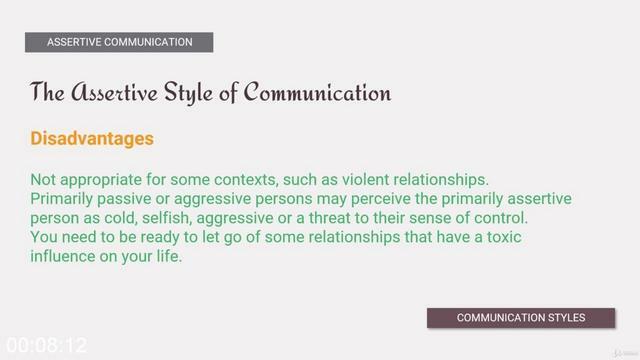 This course is suitable for anyone who would like to learn how to activate The Assertive Style of Communication in order to increase their cognitive, emotional and relational independence. While considering the multi-dimensional aspect of Assertiveness, the course will simultaneously address thinking patterns, the understanding of how these patterns shape our emotions and ultimately, how to project these inner events into observable behaviors, such as verbal and non-verbal communication and the overall management of social relationships. We will first take a look at what Assertiveness is, the reasons why you should learn this complex skill, its benefits and when to use it. 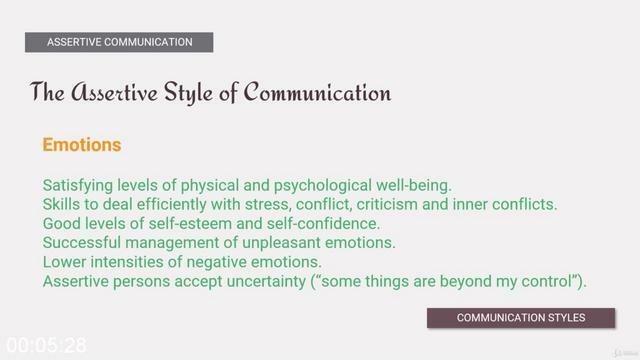 Then we will zoom in into each of the five communication styles, so that you will be able to identify them in yourself and others. We will then address the Assertive Rights or Assertive Principles and that will mark the passage to the practical part of the course. You will learn how to identify and eliminate the main cognitive distortions and how thoughts and emotions are linked in the assertive realm. 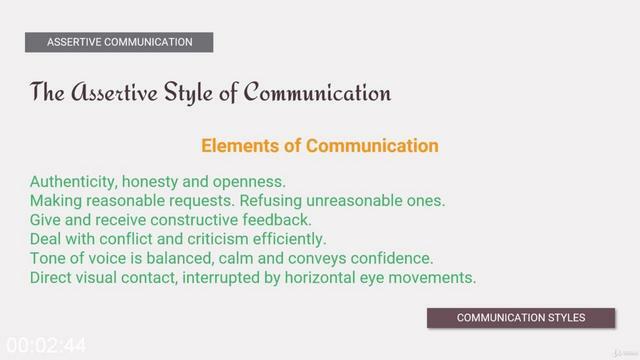 Then we will get to the really interesting part, the actual techniques and strategies of the Assertive Style of Communication. You will learn how to communicate in a more authentic and confident manner, how to efficiently deal with criticism and conflict, how to provide constructive feedback and how to make sure that your verbal message matches the non-verbal one. And then you�ll be ready to go. The foundation for the Independent you would have been laid and you will have the main skills to start creating the life you want. Anyone who would like to learn how to activate The Assertive Style of Communication in order to increase their cognitive, emotional and relational independence. 2017-10-08[PDF] The Lean Muscle Diet: A Customized Nutrition and Workout Plan Eat the Foods You Love to Build the Body You Want and Keep It for Life! No comments for "Assertive Communication Build The Independent You".